Parade on Monday, February 21, 2011, 1 to 3 p.m.
CALENDAR LISTING: February 19-21, 2011, George Washington Birthday Parade and Weekend Festivities. Largest parade in the country celebrating the nation&apos;s first president takes place on Washington&apos;s Birthday holiday, Monday, February 21, 1 to 3 p.m. in Old Town Alexandria. Part of a weekend of events that includes an historic reenactment at Fort Ward Park, the Birthnight Banquet & Ball at Gadsby&apos;s Tavern, a 10-K race, a 1-mile race just before the parade, plus free open houses at historic attractions. VisitAlexandriaVA.com or 703-746-3301. ALEXANDRIA, VA - George Washington, the nation&apos;s first president, will be honored on the 279th anniversary of his birth with a parade in his hometown of Alexandria, Virginia, on Monday, February 21, 2011, from 1 to 3 p.m. in Old Town. The George Washington Birthday Parade, the largest and oldest in the country celebrating this Founding Father, will wind its way through the historic streets of Old Town where Washington lived, worshiped and conducted business. Annually the parade includes thousands of participants including historical, community and youth groups, bands, horses and canines. Spectators line the brick sidewalks along the one-mile parade route. Events throughout the weekend in Alexandria will celebrate Washington&apos;s legacy with an historic reenactment at Fort Ward Park, the Birthnight Banquet & Ball at Gadsby&apos;s Tavern, a 10-K race, the first ever one-mile race just before the parade, plus free admission to historic sites on parade day. Historic Mount Vernon presents a Surprise Birthday Party for General Washington daily through the weekend. Earlier in the month, February 6 through 12, local restaurants will compete in the third annual Cherry Challenge as they create unique dishes and cocktails featuring cherry recipes in celebration of one of the most cherished legends surrounding George Washington. A popular vote will determine the winners, and those restaurants will receive recognition at the parade. 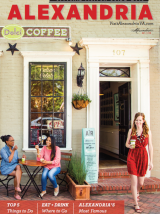 With Alexandria&apos;s charming historic setting, special events and delightful dining opportunities, visitors and residents alike can make a date to fall in love with George Washington&apos;s hometown. Alexandria restaurants are creating unique menu items featuring cherries in celebration of one of the most cherished legends surrounding George Washington. Each restaurant will develop its own cherry cocktail, appetizer, entrée, or dessert. Try them all and vote for your favorite. Winners are given special recognition at the George Washington Birthday Parade. Participating restaurants include Dishes of India, Fontaine Caffe and Creperie, Food Matters, Hank&apos;s Oyster Bar, King Street Blues Old Town, Murphy&apos;s Irish Pub, Pizzaiolo Café, Ramparts, Seagar&apos;s Restaurant (Hilton Old Town), Shooter McGee&apos;s, St. Elmo&apos;s Coffee Pub, Tempo and The Light Horse. Certified racecourse through Eisenhower Valley and Alexandria&apos;s parklands. Cash prizes, T-shirts and refreshments will be provided for runners, with the proceeds benefiting George Washington Birthday Celebration. Participate in a reenactment of the 1798 and 1799 balls George Washington attended to celebrate his birthday. Colonial attire encouraged but not required. Dancing lessons are available prior to the Ball. George Washington&apos;s Mount Vernon Estate and Gardens, 3200 Mount Vernon Memorial Hwy. Celebrate George Washington&apos;s birthday by joining the General for breakfast as he enjoys his favorite morning meal, "hoecakes swimming in butter and honey", cooked over an open fire (while supplies last). Pull up a hay bale and chat with the Father of Our Country about politics, farming, the Revolutionary War, and life in the 18th century. Following the breakfast sampling, families can participate in a "Surprise Birthday Party" for General Washington that includes rousing birthday cheers and a serenade, patriotic music and more. Join characters from the 18th century as they help visitors surprise General Washington with rousing birthday cheers and a serenade! After the birthday surprise Washington will be presented with gifts which he will describe and react to during a speech to his birthday visitors. The surprise is reminiscent of Washington&apos;s birthday in 1778 during which the Continental Artillery band serenaded Washington at Valley Forge. The Friendship Veterans Fire Engine Association sponsors this meeting at the Holiday Inn & Suites where a hearty breakfast is served. Those in attendance are treated to the first appearance of the day by George Washington and an address by a distinguished speaker. Be a part of the first-ever Parade Mile. Run occurs just before the parade on the parade route. Special winter fleece beanies will be given to preregistered race participants. Start Time: 12:30 p.m.; Start & Finish Location: The parade reviewing stands at King and Royal streets. Please note that you must be able to finish the mile in 15 minutes or less. Absolutely no strollers or pets. The nation&apos;s largest George Washington birthday parade marches a one-mile route through the streets of Old Town Alexandria. With nearly 3,500 participants including historical groups, youth from scouting groups and animals, this is still a local, community parade in honor of one of the City&apos;s favorite sons. The parade starts at 1 p.m. at the intersection of Gibbon and S. Fairfax streets. The reviewing stand is located near City Hall&apos;s Market Square, at the intersection of King and Royal streets, and ends at Wilkes and S. Royal streets. Celebrate the national observance of George Washington&apos;s birthday by visiting his home and burial site free of charge on this day. Enjoy a grand holiday party with musical and military performances. Festivities begin with a 10 a.m. ceremony at Washington&apos;s tomb, followed by Miss America 2010 singing the national anthem, spirited military demonstrations by the Old Guard Fife & Drum Corps, and the new "Surprise Birthday Party" celebration.